At long last, I got my vegetable garden put in. I had to hold off until David in Shadow and Light was out of previews and I had some hours to myself, and then the weather in mid-May was all wonky and cold, but finally a confluence of spare time and good weather kicked in. I got the vast majority of my seedlings courtesy of a gift certificate for Cox Farms (thank you, John and Barbara), and my husband and I spent part of a day turning and breaking the soil and amending it with compost from the bin in the back of the yard. I think I toted about six wheelbarrows full of compost from the bin to the garden plot. 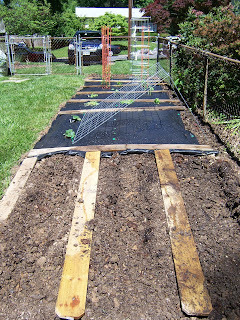 When everything was raked to my liking, I covered most of the plot with weed block fabric and started planting. In previous years, I have had to contend with a lilac bush that occupied the northwest corner of my little plot; however, the bush went into a rapid decline two years back and was mostly dead by the fall (it’s a bad sign when any tree or bush in your yard is being visited regularly by woodpeckers). John dug it up before the winter set in, so that gave me an additional couple of feet of gardening space. I changed up my usual planting pattern a bit: the green beans went right up against the western fence, the better to support them when they start twining, with the yellow wax beans next. Heading eastward, I planted two Brandywine tomato plants, a Sweet 100s cherry tomato, and four Super Marzano paste tomatoes, a Kung Pao style pepper and a sweet red pepper, basil, cilantro and flat-leafed parsley, Fanfare cucumbers and three kinds of potato (Irish Cobbler, Norlund and Yukon Gold). I also planted some giant sunflowers along the northern fence. This is the view from the eastern edge of the garden. 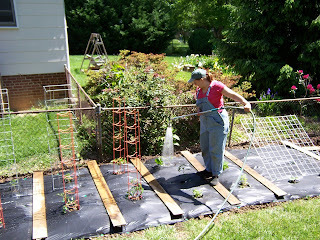 I’m trying out some new support systems this year; last year I bought five heavy duty tomato ladders from Gardeners Supply Company and found them to be a vast improvement over the traditional cone-shaped tomato cages, which buckle under heavy plants and are prone to toppling over. The tomato ladders were sturdy and a cheery red; my only gripe is that they’re not tall enough for most indeterminate tomatoes, although they work great for bush tomatoes like the Marzanos. The good folks at Gardeners Supply offered Tomato Towers this year, which are taller and square and look like they’ll do the trick for the cherry tomato and the Brandywines. I couldn’t resist another new product GS offered this year – a cucumber trellis. The idea is to get your cukes up off the ground (thus avoiding both bugs and rotting issues). The trellis wasn’t terribly expensive so I thought I’d give it a whirl. It’s been a week since I put the garden in and already the beans have begun to pop, the potatoes are just sprouting and the tomatoes look like they’ve grown an inch or two. Yesterday I caught a squirrel in the act of digging up one of the sunflower sprouts so I’m wondering if any of those will make it to maturity. It’s been a more promising spring than last year – plenty of rain, and now turning warm and humid – and I have no out-of-town trips planned this summer, so I’m hoping that the veggie garden of 2008 will be an improvement over the dessication of 2007. June 5, 2008 - 5:13 pm Joan L.
I am now hungry. Donna, can you either post or send me the recipe for the cuke dip you made long ago when we visited. I think it had garlic and mint in it. It were GUD!